Flying Doctors receive Facility Upgrade!! 06 Sep Flying Doctors receive Facility Upgrade!! 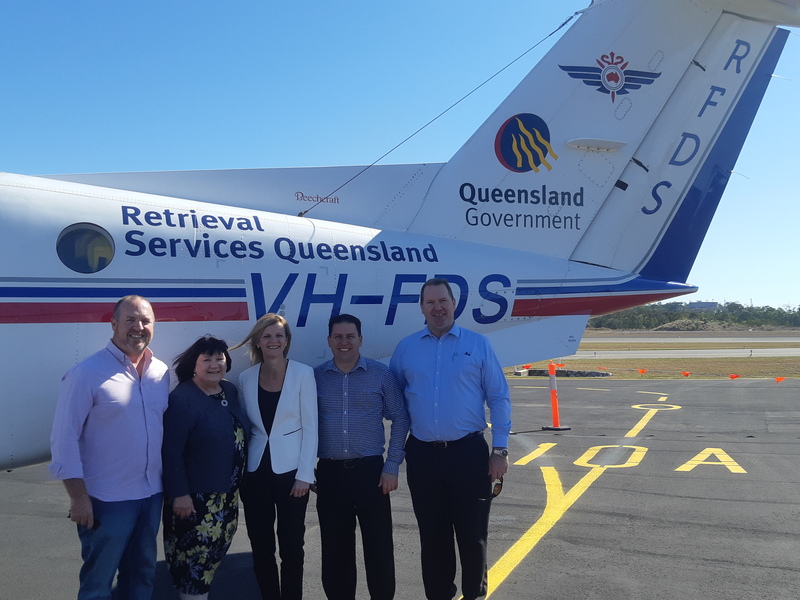 Gladstone Regional Council Mayor, Matt Burnett along with Royal Flying Doctor Service CEO, Meredith Staib officially opened the Royal Flying Doctor Patient Transfer facility at Gladstone Airport last week. To mark the opening of the facility the RFDS had an aircraft and crew in attendance. In the last 12 months, the RFDS has had 457 patient retrievals out of the Gladstone Airport. The long-term initiative from Gladstone Regional Council & Gladstone Airport Corporation has recently been completed after planning began in February last year. The all-weather facility provides RFDS pilots and their crew with a rest area and amenities housed within a portable site office donated by Bechtel. The RFDS Auxiliary fundraised for the furniture. The official opening of was also attended by Federal Member for Flynn, Mr Ken O’Dowd, State Member for Gladstone, Mr Glenn Butcher.